Here is a lovely concept. Dorota and Les Laughlin of Oliveria Melbourne partner each year with an Australian creative force to develop a limited edition olive oil decanter to raise awareness and funds for a specific social cause. The result is Peace With Earth. The 2008 Peach With Earth project in partnership with Spacecraft was devoted to Voiceless to raise awareness about the suffering of factory farmed animals in Australia. The 2007 design by Gareth Dotchin and the team at Empire Creative Group benefited Fifteen Melbourne, and the inaugural 2006 project was a partnership with MOZI to benefit Earthwatch Australia. Each year, a percentage of sales from each decanter is donated to a chosen charitable organisation. All the olive oil decanters are gorgeous, so you can simply pick your social cause of choice! 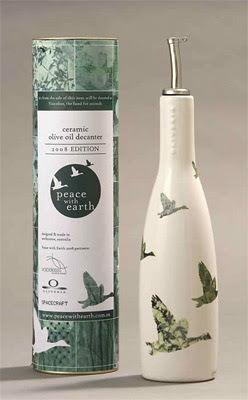 You can find Peach With Earth decanters at the online store as well as various stockists around Australia. ah darn i missed the Mozi edition - i love their work especially the incorporation on native flora/fauna. Though the spacecraft one is very sweet. A great idea - we've just discovered the benefits of buying oil in the big can and need a lovely decanter. Plus the cans can be repurposed as planters. "I love" olive decanters! Great post! Hi veri maz - I know it's sold out on the site, but I think you can still get the Mozi version around the traps. If anyone sees it in store somewhere, let us know. Hi w.w.i.i.g.g.s.s. - thanks for stopping by. I love them too. Caffiend Friend - I'm glad you like them! Helen - LUCKY THING! They will be collectors' items no doubt.